L.J. 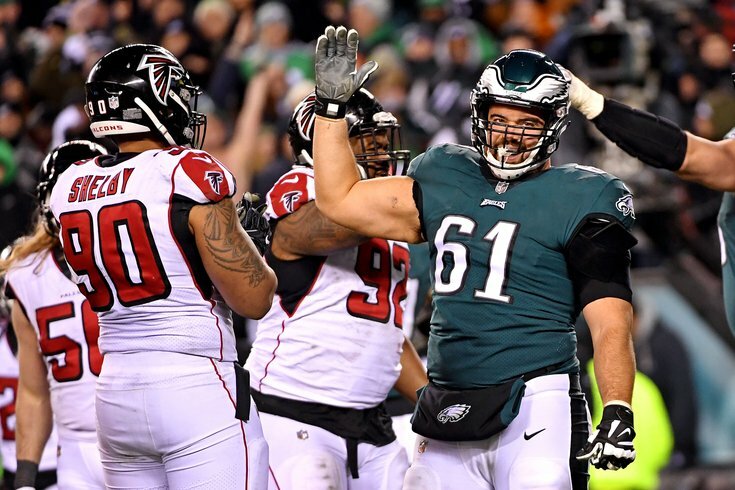 Fort and Andrew Sendejo should be rooting for Stefen Wisniewski to find a new home, and soon. In our Eagles chat this week, there were a lot of questions that we could not get to in time or other questions we did answer but could use more color. And so, let's do a mailbag post to answer some of the overflow. Question from Chris: Is there a certain end date with regards to compensatory picks and when players cancel out each other? Starting to get worried about L.J. Fort and/or Andrew Sendejo cancelling out the 4th rounder for Jordan Hicks. The end date this year is May 7. And you are right to worry. More accurately, Fort and Sendejo should be worried. I'll explain. As you can see, the projected fourth-round pick for Hicks is currently cancelled out. However, we're now 18 days into free agency, and Wisniewski, Ajayi, and Jernigan have not yet found new teams. There's a possibility that teams around the league have wised up and are simply waiting until May 7 comes and goes to sign those kinds of guys. If that happens, the Eagles are almost certainly going to release either Fort or Sendejo before the season begins to preserve that projected fourth-round pick for Hicks. A year ago, they released Corey Nelson during training camp, who would have qualified toward the comp pick formula, but didn't after his release. It's really a crappy system that is very unfair to guys like Fort and Sendejo. To note, without having seen them play in person in camp yet, the guess here is that Sendejo would be first on the chopping block. Question from Bock: What running backs not named Josh Jacobs do you like for the Birds in the draft? Now that the Eagles have traded for Jordan Howard, they have their between-the-tackles banger. They are very unlikely to double up on another one of those guys in the draft now. I think that'll lower the chances they draft a guy like Iowa State's David Montgomery, for example. The running backs that will now interest the Eagles in the draft will likely either have a lot of speed, or receiving ability, preferably both. We'll be taking a position-by-position look at five players the Eagles could draft at each spot soon. Question from SnailWhale: Is there a chance that the best player available will get a player drafted that is not necessarily a need? Like, is it possible that there is a guard/tackle/corner/linebacker/wide receiver that Philly goes with in the first round? Yes. If there’s a player that is rated significantly higher than anyone else on their board, I believe the Eagles would take them. The only two positions where that won’t apply, in my opinion, are at quarterback and tight end. Comment from Fan of Eggboy: As soon as you think you are set at a position, you are not! Yep. Rosters turn over in the snap of a finger in the NFL. What you need right now likely won’t be what you’ll need in two years. Conversely, just when you think you’re set at a position, things change and you’ll suddenly have a glaring need there. That’s yet another reason to take the best player available in the draft. Question from Norm Snead: What is Zach Ertz worth in terms of a 2019 draft pick? If Ertz has a similar season in 2019 as 2018 and is healthy, what will he be worth in terms of 2020 draft pick compensation? With Dallas Goedert coming on, it seems to make sense to trade Ertz at the top of his value and gain cap space. Agree? No, I do not agree, ha. To begin, I was talking with another reporter (Sheil?) at the owners meetings about the OBJ situation, and he made the simple point, “Is he a great player? Yes? Then just keep him.” I agree. There’s no need to get cute. That point aside, they can’t trade Ertz even if they wanted to. If they did, it’d be a charge of $10,542,500 in dead money, and you'd piss off Carson Wentz. Question from DB: Did you ever do that collect call thing in the Geico commercial? What’s funny about Geico re-running that commercial is that young people these days probably have no idea what what a collect call even is. But yes, I used to do that every day after basketball practice. I’d make a collect call to my mom, and she would decline it, but she would know it’s time to come pick me up.